Cusano 18 cigars are hand made inDavidoff's Occidental Kelner cigarfactory located in the outskirts of Santiago, Dominican Republic. The Dominican olor filler tobacco selected for the Cusano 18 is aged for an incredible 18 years! Cusano 18 cigars are hand made inDavidoff's Occidental Kelner cigarfactory located in the outskirts of Santiago, Dominican Republic. The Dominican olor filler tobacco selected for the Cusano 18 is aged for an incredible 18 years! This extra long aging process is responsible for the complex taste which is balanced by the Double Connecticut shade tobacco used for both the binder and wrapper. 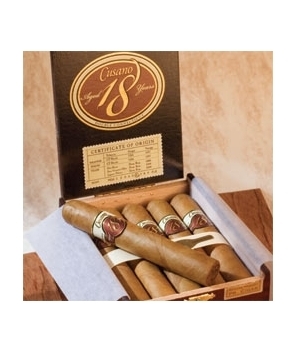 This combination of tobaccos gives Cusano 18 a mild yet full-flavored smoke with a creamy, long finish.